How to Make Extra Limbs for Cosplay « Adafruit Industries – Makers, hackers, artists, designers and engineers! The needs and demands of cosplay are vast, and you never know what sort of skills you’ll need to learn next. You could have to make extra limbs to wear around your waist. It happens. 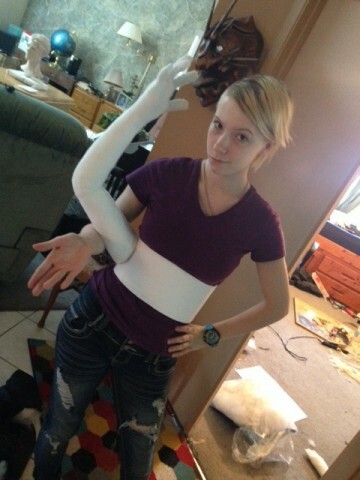 Cosplayer Hanari Solomon has done this often enough to create a detailed tutorial for lightweight, poseable arms. The build requires saran wrap, packing tape, wire, polyfill, white tights or leggings, and a few other materials. It’s not necessarily something I would have thought about having to make, but there are more than a few characters to cosplay with several limbs. After you wrap your arm in Cellophane you’ll be taking the Clear Tape and CAREFULLY (Carefully being the key word here) Wrap over the cellophane so that there are no bumps in the tape. If you were to run your hand down your arm, it should be smooth. When you’re done with that, cut it off and CAREFULLY tape the seam back together. If you can, tape both the inside and outside for stability. Fill it with some Polyfill or cotton filling and do the exact same thing for your other arm. You’ll follow the process for your hands and then start making an armature. Check out the complete how-to with photos at Tumblr. Likely a Steven Universe cosplayer. Fantastic job on the range of motion.